Although the course is laid out on flat terrain, there are many slopes and mounds all over the course thanks to Nelson & Haworth’s wonderful design, which makes it difficult to find the flat lies on fairways as well as greens. It is not a long course. However, in order to have a good score, solid course management skill is required, being careful where to hit and where to avoid. Putting is difficult because of strong undulations on the greens. There are many deep bunkers and pot bunkers strategically placed around the greens, which makes it difficult to save par. Also, chipping from off the green becomes very difficult because of the steep slopes on and around the greens. It is said that the B Course is the longest and most challenging among the three 9-hole courses but I was not able to play it. Most greens and approaches have good views. There is a pond on the left and bunkers on the right of the tight fairway. The green is a little elevated and the huge bunker on the right is in play, which makes this tough par 4 very challenging. The view of this hole with 3 high-rise buildings behind the green is attractive. A dogleg to the left with water near the green. The drive to the left side is dangerous for a long hitter because of the water. The landing area of the tee shot with a clear view of the next shot is limited. The approach shot is over the water and the green is not deep, so an iron shot with good distance is required on the approach shot. A strategic par 5. The bunkers on the left of the fairway and the pond on the right are in play. It is a wise idea not to use a driver on this hole for a long hitter because the pond covers most of the landing area of a long ball. The bunkers on the fairway and around the green are well positioned. A dogleg to the right. The shot is difficult because the fairway also becomes narrower for a long hitter and because there is a pond on the right side of the fairway. The approach shot is over the water and there is a bunker in front of the green. A challenging par 3. The deep & narrow green is squeezed by a creek on the left and 2 bunkers on the right. The green slopes a lot from back to front. It is needless to say that you need to hit an accurate shot. A club bus is available from Hong Kong and it takes only 10 minutes from the Hong Kong-China boarder. This golf course is located in downtown Shenzhen City. When it opened in 1985, there was nothing but greenery surrounding the course. But the development of Shenzhen over the last 20 years is spectacular and new buildings have gone up one after another around the course. 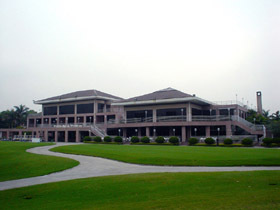 Nowadays, modern buildings surround the course, which makes the view from the course unique. The official length of AC Course is 7074 yards from the black tees and it is over 500 yards longer than the blue tees I played this time. Unfortunately, you are not allowed to play from the black tees unless you are a pro. It seems to be a matter of the speediness of play but I think that the club should give an opportunity to play from the back tees to members and accompanying visitors whose handicaps are single digit and who promise not to do play slowly. I wrote the course length as 6548 yards in the introductions above because only pros can use the official length of 7074 yards. I am not a member but I hope that the black tees will be opened to members, too. I tend to rank 3 on average out of 5 regarding the difficulty level for the 6500 yards course par 72 but ranked 4 on this course because the greens and around greens are extremely difficult. If we have a chance to play it at the official length of over 7000 yards, I guess that it will be 5 without a doubt. Robin Nelson & Neil Haworth designed courses in Asia are Bali G & CC in Indonesia, Shan Shui (山水) G&CC in Malaysia, Century Seaview (世紀海景) CC, Jade Dragon Snow Mountain (玉龍雪山) GC, Xili (西麗) G＆CC, Sheshan International (佘山国际) GC, Sun Island International (上海太陽島國際) GC, Kunshan Sunisland (昆山太陽島國際) GC, Qingdao Huashan International (青島華山國際) CC, Guangzhou International (広州仙村國際) GC and Huizhou Tangquan (恵州溫泉) GC in China.